Looking to automate your marketing efforts? These marketing automation tools might help! We all know how important a role marketing plays in the success of your business. Sure, a good product means a lot of word of mouth and press coverage, but for people to know about your product or service, you need to have the marketing smarts. However, with the rapid growth of social media, thanks to the declining prices of smartphones and internet plans, there’s a lot of noise out there. In order to break through, you need the right tools to handle all the heavy lifting while you focus on the creative. According to Marketing Automation Insider, marketing automation tools have been in the industry since 1992, the first mover being Unica. According to them the marketing automation industry is now a $1.65 billion industry and has seen $5.5 billion in acquisitions by Salesforce, IBM, Adobe and Microsoft, and others! To say that businesses are betting big on marketing automation tools would be an understatement. The reason behind this massive growth is simple- marketing automation tools save marketers a ton of time by carrying out repetitive tasks, leaving more free time to do things that matter to your business. 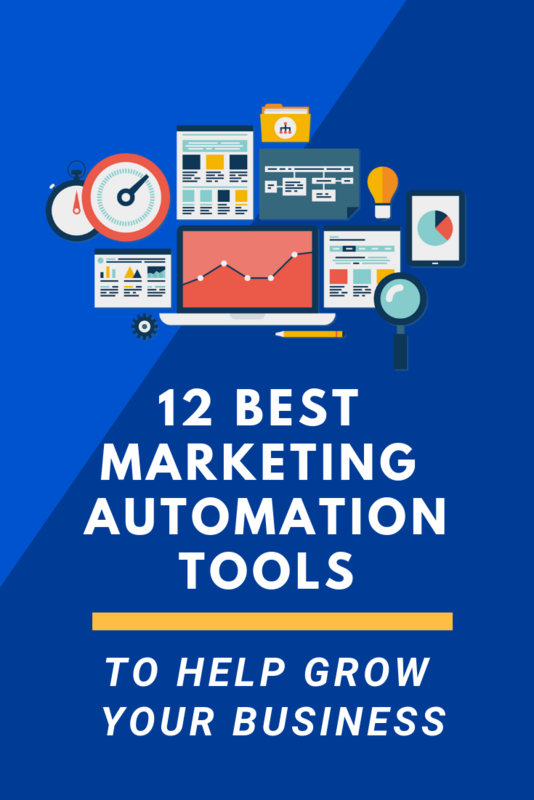 We have thus compiled a list of some the best marketing automation tools out there that will help you with all those boring repetitive tasks and make marketing less of a headache! Salesforce Marketing Cloud offers a robust, cloud-based solution to marketing automation. It is an all-in-one platform for all your marketing efforts. It allows you to build and manage any kind of email campaign, engage with customers using SMS and push notifications, integrate your social media channels, manage all your ad campaigns and create interactive content that engages customers effectively. Salesforce Marketing Cloud offers a plethora of features which scales easily with businesses of all sizes. Adroll is a marketing automation tool that specializes in retargeting. Founded in 2007, it is currently being used by over 35,000 advertisers worldwide. It allows you to place and monitor ads on both web, and mobile, including popular social media platforms like Facebook and Twitter. Its simplistic dashboard makes it easy for anyone to get detailed information on their ads and makes retargeting a breeze. iContact boasts about being the email marketing tool for everyone. iContact makes it easy for anyone to create awesome email campaigns and measure them for improvement. iContact doesn’t ignore the importance of social media marketing and lets you create sign-up forms and track engagements from your customers. It has a 30-day free trial which makes it even more alluring to try but is only limited to 100 contacts and 400 messages. Although with customers like NASA, it surely deserves a spot on the best marketing automation tool. According to Nielsen, people are 4 times more likely to buy when referred by a friend. Extole, earlier known as Tell-A-Pal, is a marketing solution that leverages the benefits of referral marketing. It allows brands to carry out and measure their referral marketing programs using the web or mobile environment. Referrals can mean discounts for both the parties and creates a win-win solution that everybody loves. With brands like Timberland and Athleta using the system, Extole is a great platform to take advantage of referrals and help your business reach more customers. Marketo has emerged as one of the best marketing automation platforms with around 2,300 customers and over 100,000 active users from all over the world. On top of Marketo’s simplicity and ease of use, it is highly flexible and sophisticated, enabling salespeople and marketers to achieve desired results. It is one of the most comprehensive platforms that can easily scale with your enterprise. With features like lead management, A/B testing, keyword analysis, customer engagement metrics etc, Marketo proves to be a great addition to your marketing arsenal! Constant Contact is one the best email marketing service with nearly every feature a small business owner would need. It’s especially useful for companies that host events, thanks to its event management and registration capabilities. OneSpot’s is a content marketing platform that uses machine learning to help promote your brand and content for maximum engagement and stay on the customer top of mind. OneSpot’s machine learning technology automatically delivers your content to your users based on their browsing history and interests. OneSpot follows a customer around the web and promotes relevant content across their social media, email, online ads, and other networks. It is trusted by big brands like IBM, L’oreal, Nestle to name a few. If you or your team use inbound marketing to generate leads, then you’ll love HubSpot. HubSpot is an inbound marketing platform with a supporting suite of sales and CRM platforms. It is well-known and widely used marketing automation software with over 34,000 customers worldwide. It provides marketers and salespeople with all the bells and whistles they need to lure customers, interact with them, provide customer support, create compelling content, target the right audience, and measure the results of your campaigns. Launched way back in 1999, Oracle’s Eloqua is a demand generation, email marketing, and lead management tool that automates a significant chunk of your marketing efforts easily. Eloqua equips marketers with best-in-class lead and campaign management tools that help marketers engage the right audience at the right time in the buyer’s journey while providing real-time reporting and insights. It also provides personalized campaigns across multiple channels including email, search, video, and mobile. You can then send personalized messages based on what you know and what people do. Other features include A/B testing, conversion tracking, customer profiles, and much more! Having a social media presence and showing up every day with interesting content is a must for new age businesses. Buffer wants to automate the boring and repetitive task for logging in various social media platforms and sharing content every day or even multiple times day! With over 4 million users, Buffer is an easy way to schedule posts, track the performance of your content, and manage all your accounts in one place. Buffer’s browser extension which integrates with WordPress, Chrome, and RSS readers, is a handy addition that allows you to save content on the go and schedule it for later. According to Forrester research, 48% of marketers are struggling to personalize customer interactions. Pardot wants to help you do that and more! A Salesforce company, Pardot helps B2B marketers to automate their marketing efforts and drive revenue. Pardot helps marketers create meaningful connections, generate more pipeline, and empower sales to close more deals. With an easy to use interface, Pardot engages buyers on their terms with dynamic, personalized campaigns. You can track and understand each step from click to close, capturing true marketing ROI. Great marketing can set your business apart from the rest and help you gain loyal customers for life. However, with so much on our plate on a day-to-day basis, marketing efforts often take a backseat. Thankfully, marketing automation tools exist to make marketing manageable for you and your business. Keep in mind that every business has a unique marketing goal. Depending upon what you are looking to automate, you can choose between any of the above-mentioned marketing automation tools. If we missed your favorite marketing automation tool, do let us know by tweeting us @bit_docs.